A black and white photograph of the Whitby Township Council. 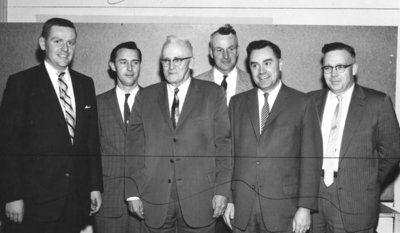 Left to right: Deputy Reeve John Goodwin, Jim Brooks, Reeve W. Heber Down, Frank Thompson, Clerk Murray Robinson, John Dryden. Whitby Township Council, January 1961, Bill Stannett. Whitby Archives 08-007-001.